We’ve come to the end of our first year so I thought I’d put a few thoughts together by way of a review. 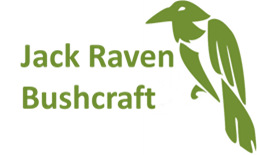 It’s been a rewarding year and Nicola and I are more convinced than ever that we made the right decision in setting up Jack Raven Bushcraft. The start of the year was all about getting the camp in place, the yurt, the composting loo, the kitchen area and so on. A massive thanks to Frank for helping out with this. I didn’t have a 4×4 at the time, so we carried everything across the field and into the wood by hand. And of course everything had to be built by hand. Willow was 3 months old by this time and an ever present with us. She had to wear a red coat so we could see her though, a yellow Labrador really blends in with leaf litter. Our first ever course took place over the 2nd weekend in February; it had been a mild January but then the weather took a turn for the worse. A hardy group of 6 students came along and undertook the course in 8 inches of snow and night time temperatures of -12oC. Everything froze, the water in the hand washing bowls, entire jerry cans, the gas bottle, even the toothpaste in my rucksack; we put things in the cool box to stop them freezing. With Nicola, Frank and the 6 students, I was responsible for the wellbeing of 8 people in relatively harsh conditions and whilst we were only in Kent, we were none the less a few miles from the nearest road of any size; it certainly hit home that what had been my hobby was now a serious job with implications of not doing it correctly. In preparation we’d stocked the yurt with firewood and with a little re-jigging of the schedule we kept everyone warm and well fed and sent them all home happy. From that chilly start we went on to run another 15 courses in 2012. My personal favourites are the 5 day bushcraft experience, because those extra few days allow me to get to know the students better, carving because of its meditative aspects, and wild foods & woodland cookery because I have a specific interest in plants and I love eating! In June we went to the Sunshine Child Festival on the Isle of Thanet, where we did some fire lighting and carving with the children. I really enjoyed this event and it was great to see the kids making honey spreaders. We also attended the Bushcraft Show and the Wilderness Gathering, two very different events but both very enjoyable. Towards the end of June we had a team building day with a group of ladies from IATEFL. This was a little unusual as they had initially asked to do some bushcraft until early afternoon and then use the wood to do some yoga. I told the event co-ordinator that would be fine; the woods would be a good place to do yoga as I really enjoyed doing tai chi there. They liked the idea of doing some tai chi so we ended doing a couple of hours with them, many thanks to my teacher Ho Kyung for coming along. We are very proud to have become Approved CPD Providers for the Institute for Outdoor Learning and next year we will be delivering the training for the IOL’s Foundational Bushcraft Competency certificate. I went to an assessment carried out by Dave Watson and Kevan Palmer and that proved to be invaluable and will help in our teaching of the course. Of course, there have also been unexpected rewards, meeting so many great people, some of whom have become friends. We had a great response from people that volunteered to help out on the woodland management (special thanks to Jerky Shack Derek for writing the plan and Kaos Blacksmiths’ Ross for his chainsaw work). And it would be impossible to write a review of the year without thanking Joe, Helen and Gordon for the use of their woodland and their fantastic support for what we are doing. We are looking forward to seeing familiar faces again and meeting new people next year; we really can’t wait! Hi Gary, I live in Cwmbran, South Wales. Do you have any courses near me? I am 55 and my son is 29 and we have been looking to do this type of thing for some time now. Any info gratefully received. Hi Andrew, we’re based in Kent and unfortunately we don’t run any courses near you. My friend runs a bushcraft company in Pembrokeshire – Buzzard Chris Bushcraft – maybe give him a try.